The little Xacto knife we’ve had in the toolbox has proved unequal to the tasks that arise in the laser lab: the point is often broken off the blade. So I picked up a cheap utility knife and a bunch of blades for it. These blades are quite a bit thicker than the Xacto knife blades, so maybe they will last longer and do a better job. 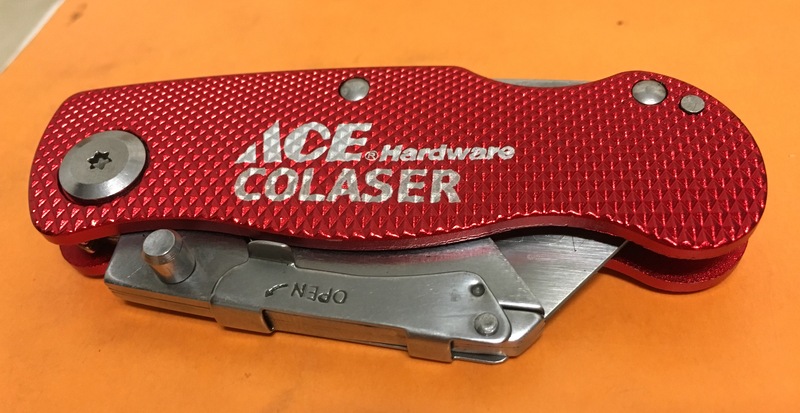 The body of the utility knife is red anodized aluminum, so I took the opportunity to do a little raster engraving. I used 50% power and 100% speed and the results are very nice, almost identical to the manufacturer’s logo.